We are fortunate to live in a place where we have access to delicious, locally grown sour cherries. 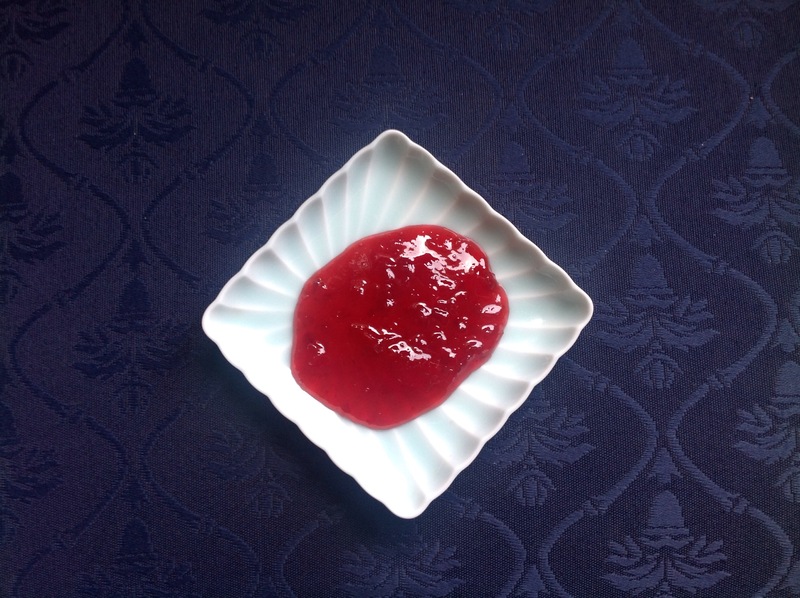 When we restock our supply we set some aside to make this cherry jam. I prefer jam that is not too stiff, so I use a bit less pectin than a full packet. This jam is not only good on toasted bread, but a great filling for tarts, pastries, and cookies. I also love it paired with cheese. Begin by bringing a waterbath canner filled with water to a boil. Sterilize 5 half-pint jars in the dishwasher or boiling water and prepare lids and rings by boiling. Place cherries and juice in a food processor and pulse a few times to make a chunky purée. Pour into a heavy bottom pot. Add sugar and bring to a hard rolling boil. Boil for 1 minute. Remove from heat and add almond extract. Stir. Add pectin and stir to dissolve. Pour into prepared jars, leaving 1/2 inch of space at the top. Wipe rims with a damp paper towel and screw on lids. Waterbath for 10 minutes at sea level, 15 minutes at high altitude. Makes 5 half-pint jars.